When Arthur and Beryl Crabtree are set to begin a quiet life at last, their four grown-up children return home one by one. With a son-in-law and neighbours always popping in as well, the quiet life never gets started. The normally friendly village of Lymston is plagued by vile anonymous letters. When a mother of three takes her own life, following such a letter, Ms. Marple is not at all convinced things are as they seem. Jean Price is the idealistic, newly-elected Labour Party Member of Parliament for a deprived inner-city constituency. She must try to balance her work with her family life, learn the ways of the House and try to keep her principles. Maggie and Andrew are looking forward to retiring to France when their orphaned grandchildren, who they barely know, become their wards. The children are hostile, peculiar eaters and Maggie resentful of the change in plans. Liz is the somewhat helpful hhousekeeper. Penelope Keith runs this show! Penelope Keith CBE OBE is better remembered for her roles as Audrey Fforbes-Hamilton in "To the Manor Born" and "The Good Life" as Marjery Ledbetter. 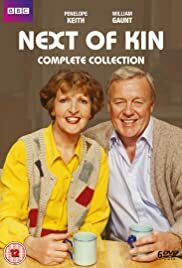 In this series which was prematurely shortened, she and William Gaunt plays parents and grandparents who must raise their three orphaned grandchildren after their son and daughter-in-law have died in a car accident. The children are now orphaned and now must be raised by their grandparents who are not normally affectionate towards children even their own son. The news and circumstances that they must endure but the writers do a splendid job in bringing the unlikely pair of grandparents who probably would prefer traveling the world rather than raising their own grandchildren. This show could have been a hit if it was allowed too.